From dorm rooms to boardrooms to--yes--bathrooms, personal devices live on-the-go. Yet, unlike our hands, they often go unwashed for months and even years. With this premise in mind, entrepreneur Scott Bushaw created HÄNS Swipe-Clean--the world’s first all-in-one device touchscreen cleaner that destroys grime where bacteria live, while leaving behind a streak-free screen. 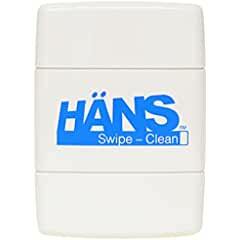 HÄNS Swipe-Clean was developed as a sustainable method for removing grime and fingerprints alongside these worry-causing germs. • All-in-One -- One side applies a controlled amount of HÄNS proprietary cleaning solution, while the other side gently polishes and dries. • Versatile -- HÄNS is safe to use on all device screens and cases, making it a smart choice for personal smartphones, ipads, workplace tablets, and any public screens. • Proprietary Cleaning Solution -- HÄNS’ unique cleaning solution breaks apart grime, grease, dirt, and oils where bacteria and germs live and multiply. • Travel-Friendly -- Its compact, leak-proof design is easy to fit in purses, backpacks, and more. • Long-Lasting -- Each unit lasts for hundreds of swipes and is refillable for thousands more; meaning ongoing savings. • Eco-Conscious -- Over the last four years, users of HÄNS have kept over 5.5 million single-use wipes from being used and ending up in landfills.